The total investment in real estate development in the first nine months of 2017 was 8,064.4 billion yuan, a nominal increase of 8.1 percent year-on-year, the growth rate increased 0.2 percentage points over the first eight months of 2017. 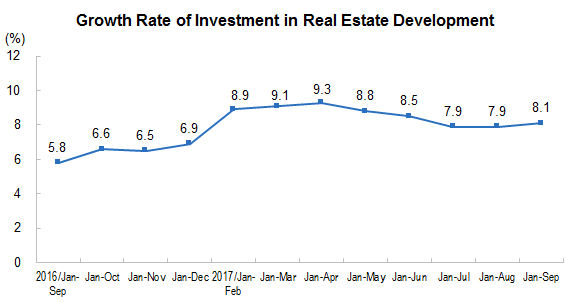 Of which, the investment in residential buildings was 5,510.9 billion yuan, up by 10.4 percent, 0.3 percentage points higher, accounted for 68.3 percent of real estate development investment. In the first nine months, the real estate investment in eastern region stood at 4,286.9 billion yuan, up by 9.0 percent year-on-year, and the growth rate was up by 0.2 percentage points over the first eight months in 2017; the central region stood at 1,716.9 billion yuan, went up by 13.3 percent, and the growth rate remained the same level; western region stood at 1,741.0 billion yuan, up by 3.6 percent, down by 0.4 percentage points; northeastern region reached 319.7 billion yuan, decreased 3.3 percent, the pace of drop rate narrowed 4.1 percentage points. In the first nine months, the floor space under construction by the real estate development enterprises accounted for 7,380.65 million square meters, a year-on-year increase of 3.1 percent, stayed in the same level over the first eight months in 2017. Of which, the floor space of residential building construction area was 5,053.30 million square meters, up by 2.9 percent. The floor space started this year was 1,310.33 millions square meters, up by 6.8 percent, and the growth rate was down by 0.8 percentage points. The floor space of residential buildings started in the year amounted to 941.13 million square meters, up by 11.1 percent. The floor space of buildings completed stood at 576.94 million square meters, went up by 1.0 percent, and the pace of growth rate went down by 2.4 percentage point. Of which, the floor space completed of residential buildings stood at 412.60 million square meters, went down by 1.9 percent. 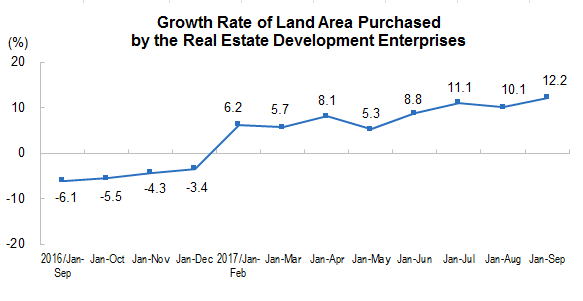 In the first nine months, the land area purchased by the real estate development enterprises totaled 167.33 million square meters, was up by 12.2 percent year-on-year, and the growth rate was up by 2.1 percentage points over the first eight months in 2017. The total transaction of land reached 814.9 billion yuan, increased 46.3 percent, and the pace of growth rate went up 3.6 percentage points. 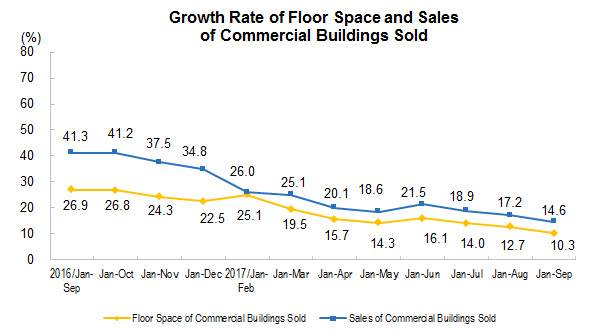 In the first nine months, the floor space of commercial buildings sold stood at 1,160.06 million square meters, a year-on-year increase of 10.3 percent, and was down by 2.4 percentage points over the first eight months in 2017. Of the total, the floor space of residential buildings increased 7.6 percent, office building increased 32.7 percent, and buildings for business use increased 23.7 percent. The sales of commercial buildings amounted to 9,190.4 billion yuan, an increase of 14.6 percent, the rate of growth went down by 2.6 percentage points. 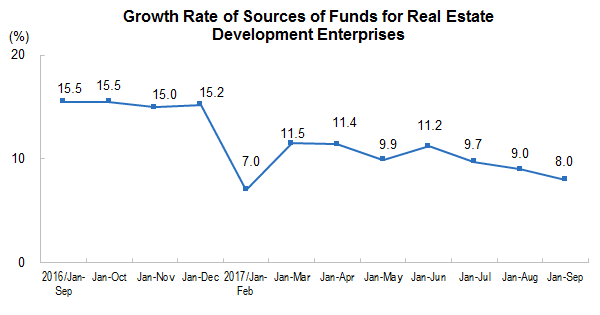 Specifically, the sales of residential buildings went up by 11.4 percent, office buildings was up by 25.2 percent, buildings for commercial business increased 31.8 percent. In the first nine months, the sale of floor space of commercial buildings in eastern region amounted to 506.56 million square meters, the growth rate increased 5.5 percent year-on-year, the growth pace was down by 2.4 percentage points over the first eight months in 2017. The amount of sales stood at 5266.2 billion yuan, went up by 6.9 percent, the rate of growth narrowed 2.9 percentage points. The sale of floor space of commercial buildings in central region amounted to 305.21 million square meters, increased 13.9 percent, and the pace of increase went down by 2.7 percentage points. The amount of sales stood at 1,845.4 billion yuan, increased 23.5 percent, and the pace of increase narrowed by 2.5 percentage points. The sale of floor space of commercial buildings in western region amounted to 289.68 million square meters, increased 16.0 percent year-on-year down by 2.6 percentage points over the first eight months in 2017.The amount of sales stood at 1,699.7 billion yuan, went up by 32.0 percent, the growth rate went down by 3.1 percentage points. The sale of floor space of commercial buildings in northeastern region amounted to 58.62 million square meters, rose by 8.0 percent, the growth rate went down 1 percentage point over the last seven months of 2017. The amount of sales stood at 379.0 billion yuan, went up by 21.5 percent, the growth rate went up by 2 percentage points. At the end of September, the floor space of commercial housing for sale reached 611.40 million square meters, decreased 12.12 million square meters compared with that at the end of August in 2017. Of which, the residential buildings for sale decreased 9.38 million square meters, office buildings decreased 0.67 million square meters, buildings for business use went down by 1.38 million square meters. In the first nine months, the sources of funds for real estate development enterprises reached 11,309.5 billion yuan, up by 8.0 percent year-on-year, narrowed 1 percentage point over the first eight months in 2017. Specifically, the domestic loans stood at 1,900.3 billion yuan, increased 19.5 percent, foreign investment stood at 11.3 billion yuan, an increase of 0.9 percent, self-raising funds stood at 3,645.1 billion yuan, down by 0.3 percent, and other sources stood at 5,752.8 billion yuan, up by 10.4 percent. Among the other sources of funds, deposits and advance payments totaled 3,461.0 billion yuan, increased 16.9 percent, personal mortgage loans totaled 1,773.9 billion yuan, up by 1.3 percent. 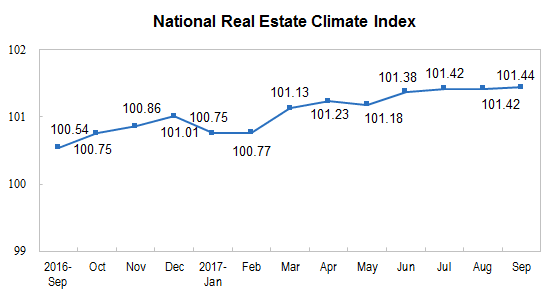 In September, the national real estate climate index (the value released from this year was after revised by the based period) was 101.44, up by 0.02 month-on-month.